When 17-year-old Makoto Konno gains the ability to, quite literally, “leap” backwards through time, she immediately sets about improving her grades and preventing personal mishaps. However, she soon realises that changing the past isn’t as simple as it seems, and eventually, will have to rely on her new powers to shape the future of her and her friends. I watched it yesterday night. I would say the standard belongs to those of Tokimeki Memorial: Only Love. The plot and excitement is not high enough to be considered near Bleach or GhostHunt, but the whole thing is not as lame as Kyo No Go No Ni or Shinigami No Ballad. However its not the best Movie Anime (Movime) that I have watched. 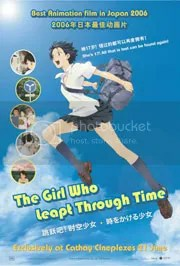 The best is Spirited Away followed by Howl’s Moving Castle and lastly it is The Girl who leapt through time. Anyway I really enjoyed watching the movie especially hearing the Japanese words coming from their mouths. =) If you’ve got money to spare and loves Japanese like me, then go watch it. Cathay’s prices are 50cents lesser than GV and Shaw! Posted on June 27, 2007 by ignorantsoup	This entry was posted in Anime, Movies. Bookmark the permalink. ← Teachers and their workload.